Multi award winning and leading Loch Ness Monster researcher, Mikko Takala, presents his ultimate award winning Loch Ness livecams with many more innovations coming soon. Here you can watch for Nessie, the famous monster in Scotland's beautiful loch. In the site you'll find facts, figures and fun about the loch. Our grateful thanks to the many hundreds of thousands of you who have emailed us with generous messages of praise and support for this webcam. It's what makes it all worthwhile and we look forward to developing our service and providing an ever improving and officially original Loch Ness Live Cam!!! Laugh? You'll wet yourself! Loch Ness Monster Tai Chi with Nessie & the sheep!!! Government Admits Nessie Does EXIST!!! 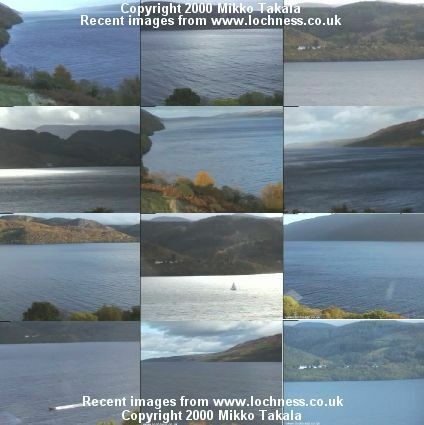 Unless expressly stated otherwise, all material on this website is copyright of Mikko Takala(electronics and computing designer of the "Loch Ness 2000 Exhibition" in Drumnadrochit). STUNNING!!! April ADVANCED SONAR ROBOT DRONE DROID UNCOVERS new photo evidence of a plesiosaur in Loch Ness. Exclusive HERE! The sounds of Nessie, the Loch Ness Monster - click here to listen! Your comments: "Best site on the web, always reminds me of many happy holidays spent in Scotland" (P. Hemsill, Omaha). Nessie spotted on this camera!!! "I still cannot believe I can look at something "live" halfway round the world on my computer. I love your website and visit it often. Who knows? I may see Nessie yet!" (Myra Inouyen, Hawaii). 2017 The latest Nessie sightings are right here! See Qwikcast.com forecast for Inverness, GB . Contact Us. We want to hear your comments about this webcam! A Loch Ness Monster is spotted on this webcam! Nessie - Loch Ness Monster Live images brought to you by Nessie on the Net! Our Loch Ness Weather Station LIVE! Click here! Spotted Nessie? Use the Snapshot button! Live Image - watch closely for a few minutes. The sheep are called Leila & Pi! Thanks to StarDot Technologies for the cameras. Castle Cam = 3 seconds refresh. Streams and images will reflect current network conditions. Online 24 hours. Visible Dawn - Dusk (currently 08.30 - 16.15 CET - UK time) Naturally, during night hours the image is black but you may see UFO lights as the area is also world famous for extra-terrestial visits! The beautiful Scottish Highlands are under grave threat from thousands of new and terrible mega-pylons. Health and environment may be savaged. Please read this page and sign Pylon Pressure's e-petition. �1000 Prize!!! - Nessie Alive and Well - William Hill Nessie Photo Awards - read all about it! The web camera is located at a vantage point overlooking Loch Ness and Urquhart Castle. The Loch Ness Investigation Bureau (LNIB) were active during the 1960�s and early 1970�s (weird beards were in fashion back then!) and a large team of dedicated individuals kept a more or less constant vigil over the loch. Many photographs were taken of strange anomalies in the water and some of the video evidence has still not been explained. Loch Ness plunges to a depth of over 250m (750 feet) and the crushing pressure and pitch black water has made investigation by diving more or less impossible. Nevertheless, one or two submarines have paid a visit to the bottom but have failed to locate comprehensive proof of a large monster. Over the years hundreds of witnesses have come forward with tales of what they have seen in or around the loch. Classic evidence includes stories of upturned boats and serpent-like necks twisting up out of the water. Sadly, some Loch Ness researchers now seek to debunk the possibility of unknown monsters living beneath the loch. But their evidence must be placed in context, particularly as some of the loudest debunkers are not qualified scientists. Some are formally unqualified people with their own pet theories, which they wish to see accepted by the public at large. Certainly, this website believes that a great deal of evidence exists in favour of the existence of a Loch Ness Monster phenomenon. Copyright Mikko Takala 2018. All rights reserved.